I've always planted a forsythia bush or two at each home we've lived in. The last home; the one we are moving from, already had been honored. Several years to be sure, as it is massive and strong. The woody limbs eventually forced over our wooden fence, so we trim the back a little more. But then more trimming means more growth. When I see buds appear I know Spring will be here soon. I almost missed it this year. I saw buds one weekend, and by the next, they were blooming. So last week I cut a few branches to bring home and enjoy. My older daughter bought me my first galvanized watering can quite a few years ago. 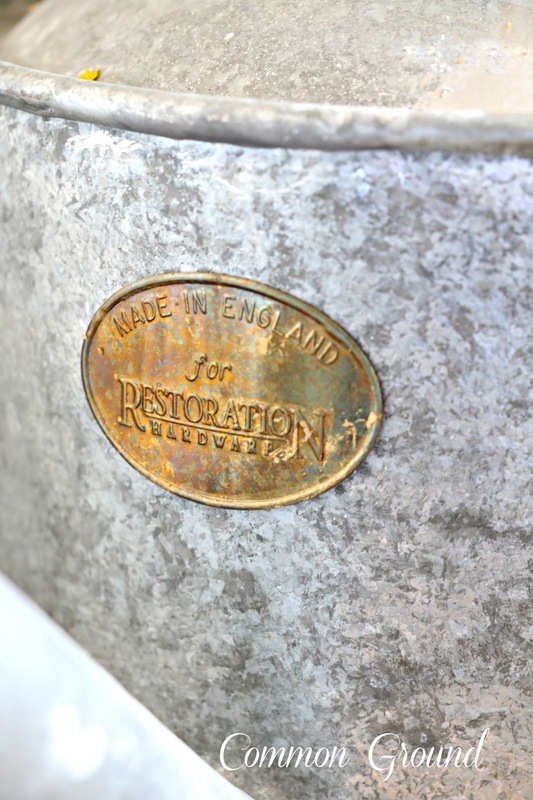 Restoration Hardware, one of her favorite places, had a line of vintage inspired sprinklers and garden goods. I was thrilled, and that started me on my quest for old ones. So now I have to share my bunny silhouette pillow that I nabbed at Leola's Home and Garden Open House a few weeks ago. Pam had several, all uniquely different. 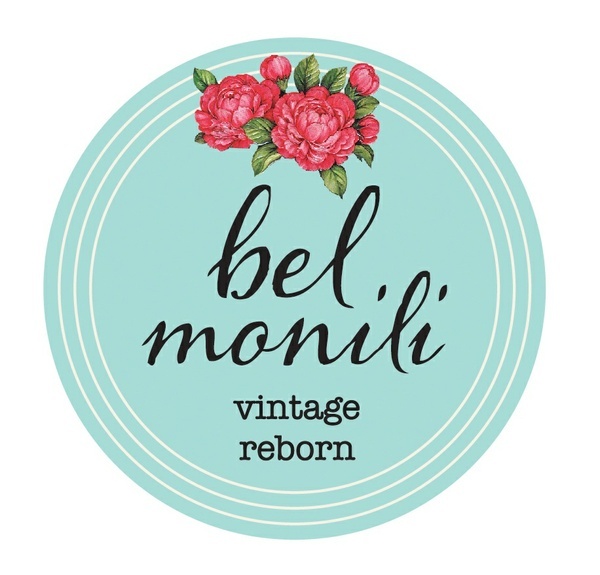 I loved the brown vintage look floral, so I grabbed it first thing! Looks like he's ready for a tasty nibble. At least with this "new" watering can I don't have to worry about leaks. Everything is greening up, but lot's of pollen. I have a Bradford Pear in the back yard here. Can't wait for it to be in full bloom. The pillow is adorable. Thanks for sharing your lovely Forsythia. Oh, I LOVE the bunny pillow! How cute is that! Pretty pretty! I love your new pillow. 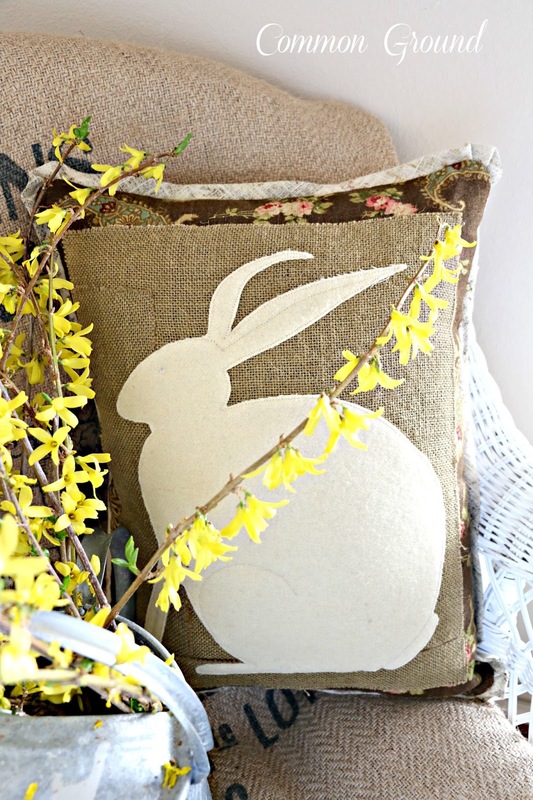 Forsythia is always the arrival of spring, and it looks perfect with your bunny pillow, such a sweet vignette! So pretty and the bunny pillow is darling. I lost my forsythia bush about 5 years ago and never replaced it. I will have to think about doing that. It grows wild in the ditches here, so I may just take a cutting from some that is wild and reroot it. Beautiful blooms and bunny:) Love that watering can! We are covered up with pollen too, sure sign that Spring is here! Enjoy your day dear friend, HUGS! Love that pillow! Great to leave out all year too! 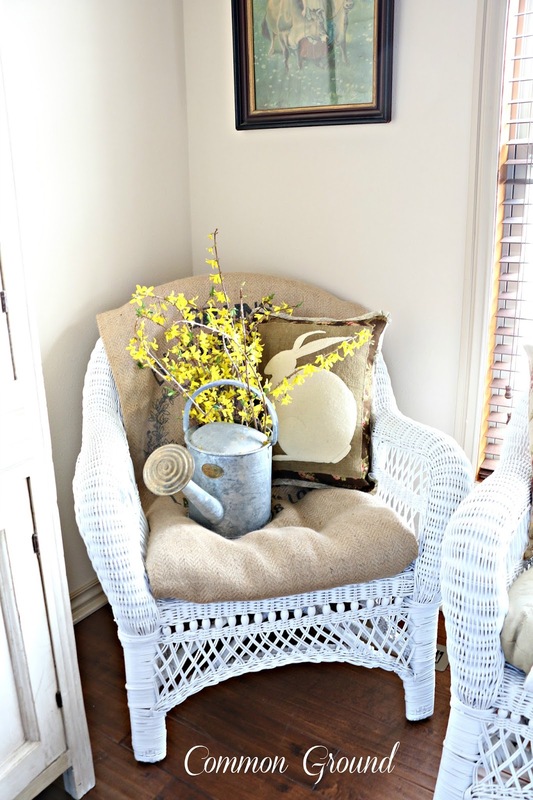 This is simple and full of spring goodness...so pretty...love the bunny pillow! Debra I love the bunny pillow!! It's so adorable. 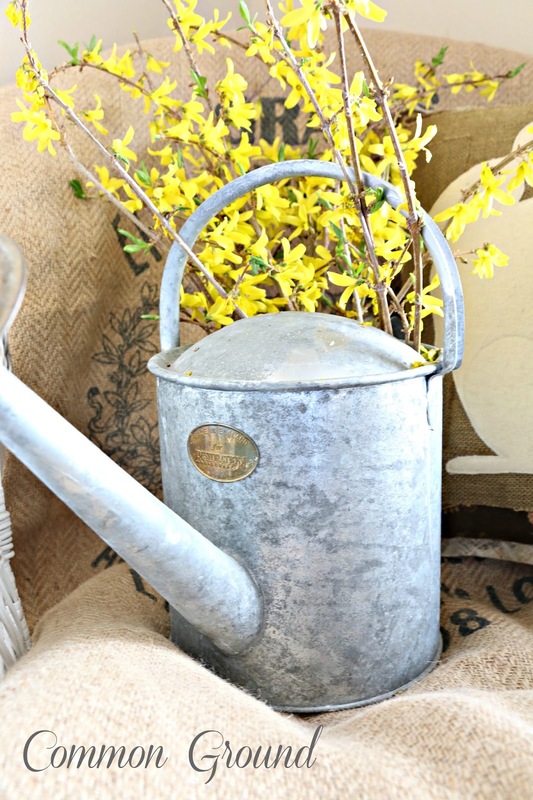 Your watering can looks so good with your pretty blooms. That pillow is so darn cute, Debra and that's probably one of the nicest looking repro watering cans that I have seen...I love it! Oh I love that bunny pillow, I especially love the "shape" of the bunny, really has such character to it. Do you know what Forsythia has to do with lawns? When forsythia starts to bloom it's time to fertilize your lawn with a feed and weed. That's how I keep track. Have a great day! 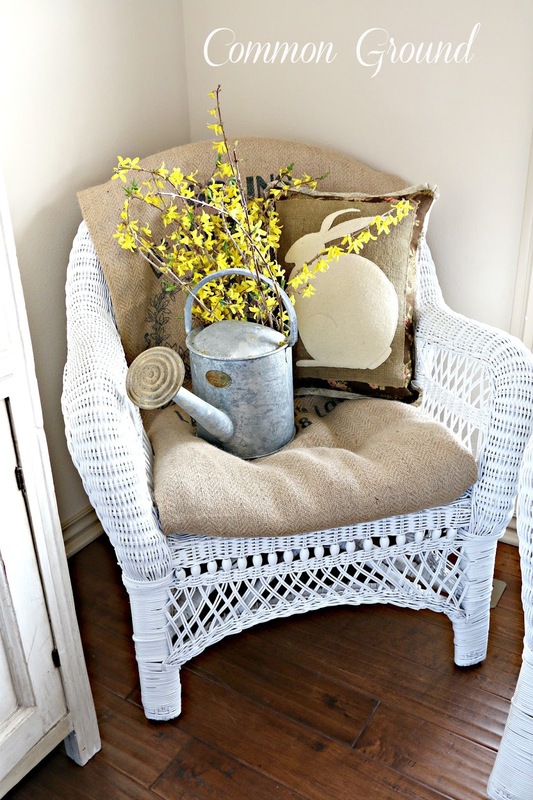 Your chair with the forsythia in the old vintage looking can is so pretty. I love the bunny pillow it was meant to be for you. It had your name written on it. So happy you found such a cute and perfect pillow. The whole vignette is great. Have a great Sunday and great start to the week ahead. 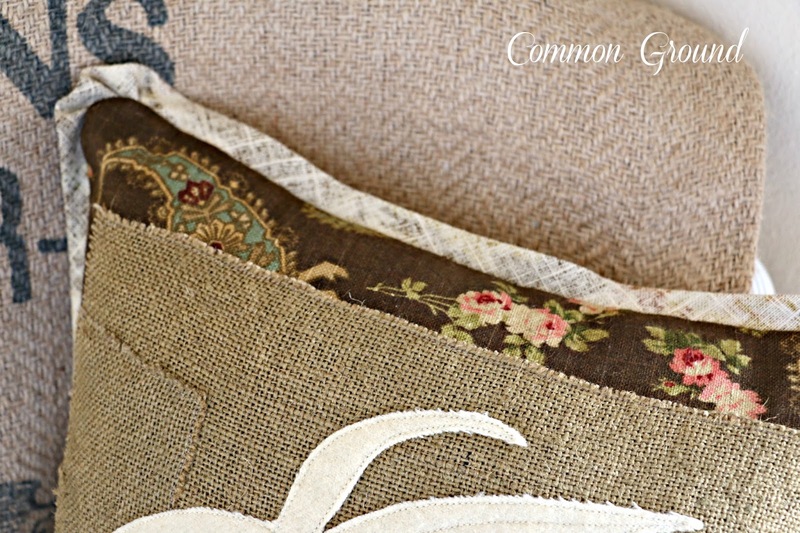 Love, love, Love the whole vignette! 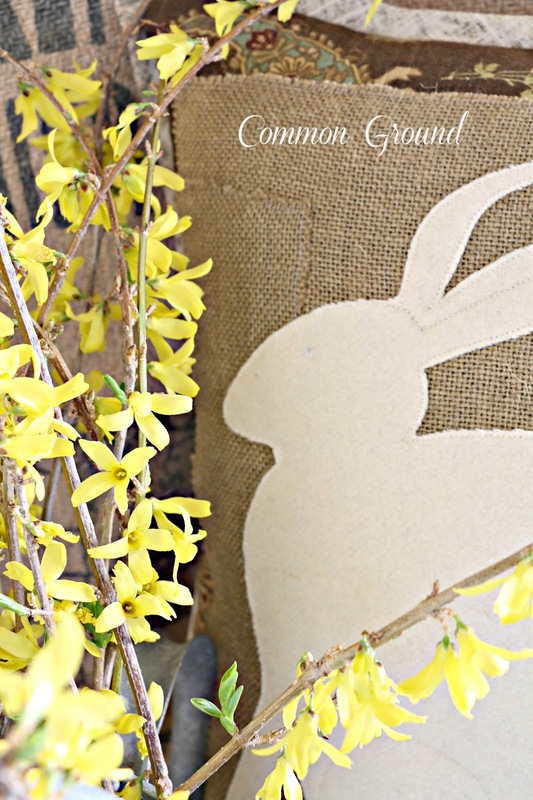 The bunny pillow is pretty and the watering can divine! 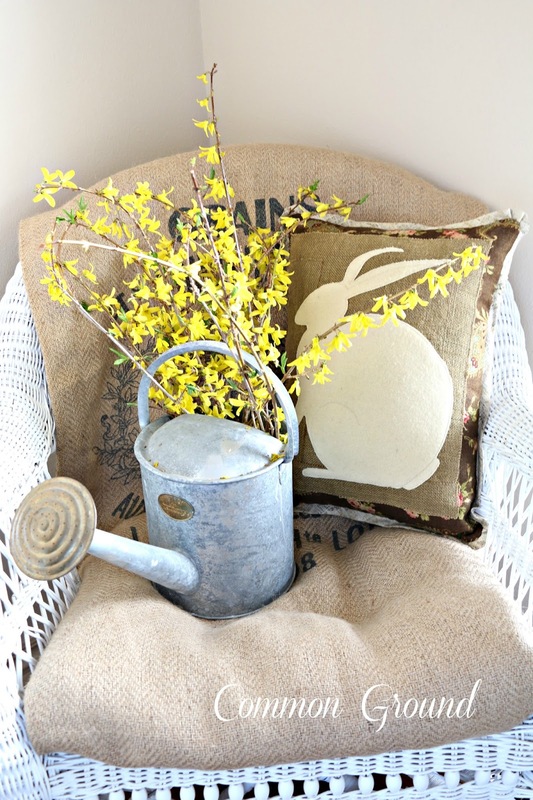 Love the watering can and forsythia, so fresh and springy! How sweet! The pillow is beautiful! it all looks great, debra! 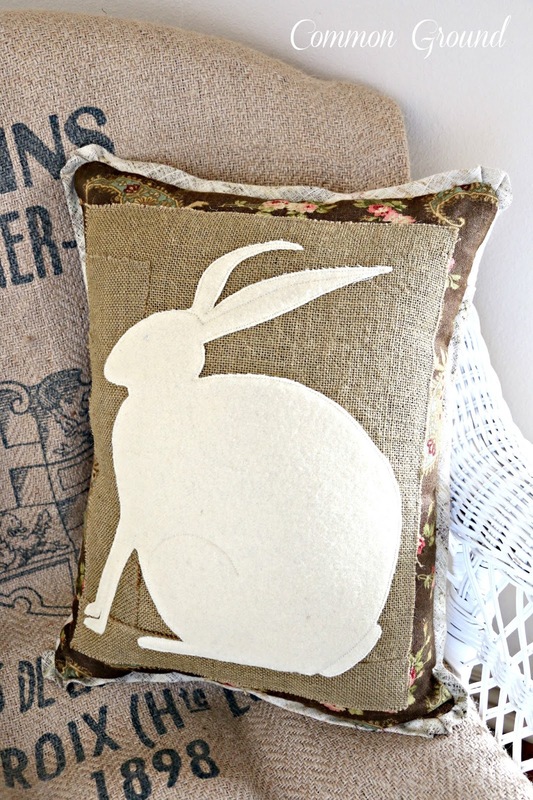 darling bunny pillow, and i LOVE the sweet watering can! cute header! happy weekend!